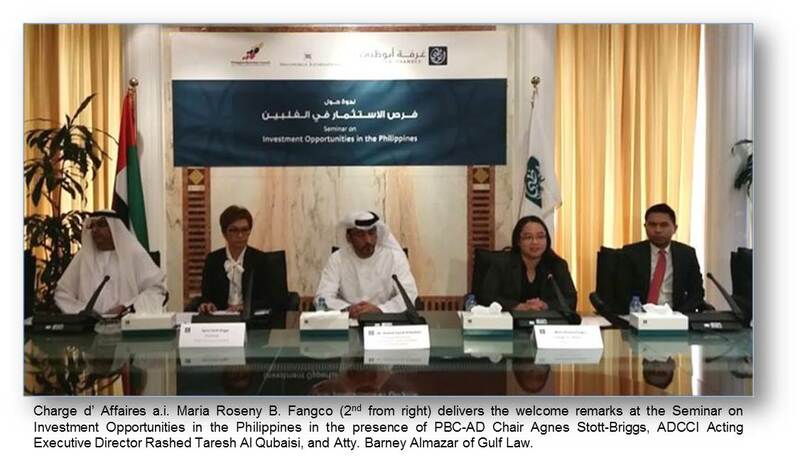 26 March 2015 – Philippine Embassy in Abu Dhabi Charge d’ Affaires Maria Roseny B. Fangco was a speaker for the Seminar on Investment Opportunities in the Philippines, organized by the Abu Dhabi Chamber of Commerce and Industry (ADCCI), Philippine Business Council of Abu Dhabi (PBC-AD), and Megaworld International on March 19 at the ADCCI premises. The seminar brought together executives and business professionals from the Philippines and the United Arab Emirates (UAE) to share experiences and knowledge about investing in the Philippines, particularly in integrated tourism estates and master-planned township developments. Mr. Rashed Taresh Al Qubaisi, Acting Executive Director for the Communication and Business Sector of the ADCCI, delivered the opening remarks. “The ADCCI is striving, through this seminar, to increase the value of two-way trade to help improve any difficulty facing the development of cooperation between companies and businessmen in both countries, as well as to find mechanism sufficient enough to maximize the UAE private sector utilities of investment and centers available in the Philippines,” Mr. Al Qubaisi said. Ms. Fangco said that the bilateral relationship between the UAE and the Philippines does not revolve only in labor relations, citing the Philippines’ robust trade figures and healthy exchange of tourism. She encouraged that now is the best time to invest in the Philippines, which is now considered the tiger economy of Asia. “I invite you to look at our property market, as well as the other industries that the Philippine government included as investment priorities, namely, manufacturing, agri-business and fishery, economic housing, public-private partnership, hospitals, energy, services, infrastructure and logistics,” she added. PBC-AD Chair Agnes Stott-Briggs spoke about promoting trade and investments between the two countries. Ms. Marivic Acosta, Senior Vice President of Megaworld International, discussed investment opportunities in Megaworld properties. A panel discussion on foreign ownership, property acquisition and retirement was facilitated by Atty. Barney Almazar of Gulf Law.